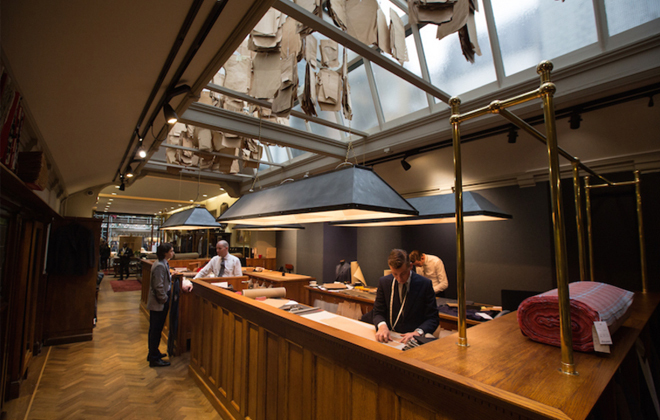 Savile Row in Central London is famous for the many bespoke tailor shops that have lined the street since the first shop opened in 1846. So much so, that along with being nick-named “The Golden Mile of Tailoring,” it was on this tiny street that the term ‘bespoke’ was first coined, as a way for tailors to know that a suit had “been spoken for” by a specific customer. Who knew? Henry Huntsman first opened his tailor shop on Dover Street in 1849. By 1919, with an already impressive roster of royal and distinguished patrons, he moved the shop to Savile Row, where it still stands today. 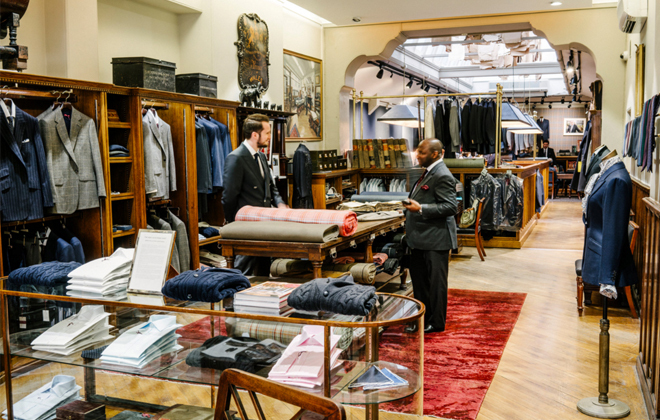 Throughout its early tenure the shop tailored the Royal family, created uniforms for the war effort, and revolutionized men’s suiting with the one-button jacket, which is still the House Style today. In the 1950s and 60s, the Huntsman began catering to the ‘new royalty’ of Hollywood stars. Gregory Peck famously only wore bespoke suits from Huntsman, and stars like Clark Gable and Katherine Hepburn (btw, love that she loved wearing suits!) were outfitted by the famed tailor for films and red carpets alike. 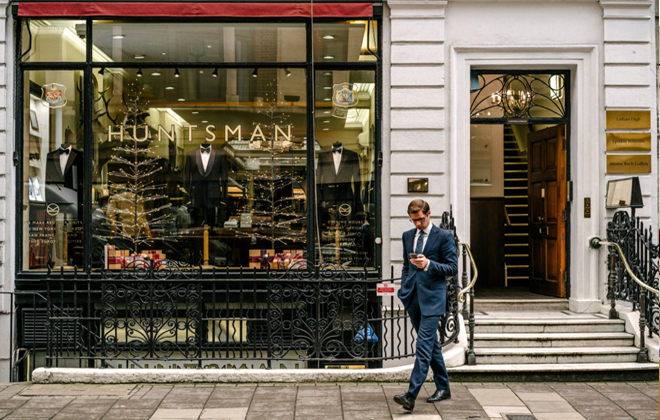 “My father was not a dandy, or a clotheshorse, but he appreciated the craftsmanship and the excellence,” Anthony Peck recalls to the Observer of his father’s 50-year relationship with the Huntsman tailors. Headline cover photo (on top) of Savile Row storefront by Tom Jamieson for The New York Times. 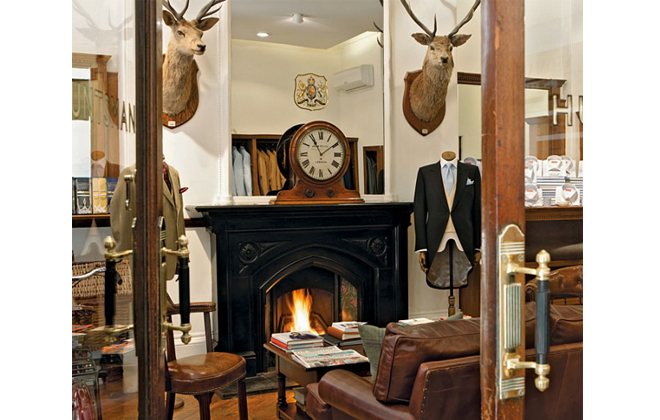 Nothing like a roaring fire while trying on your bespoke suiting. And it’s that same craftsmanship and excellence that after over 150 years of operation in London, the Huntsman is bringing to New York City. 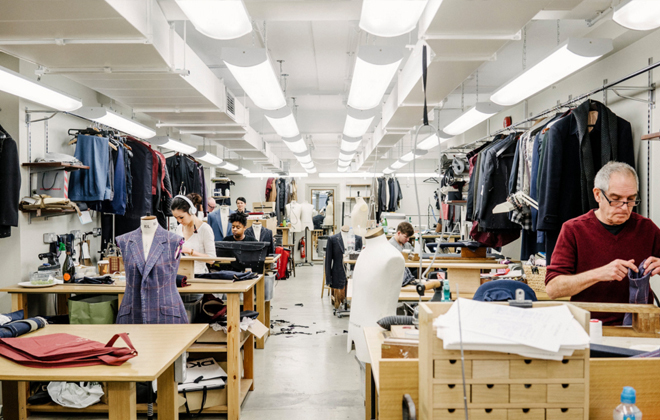 The tailor opened shop in a very quiet, nondescript apartment building on West 57th Street this winter. 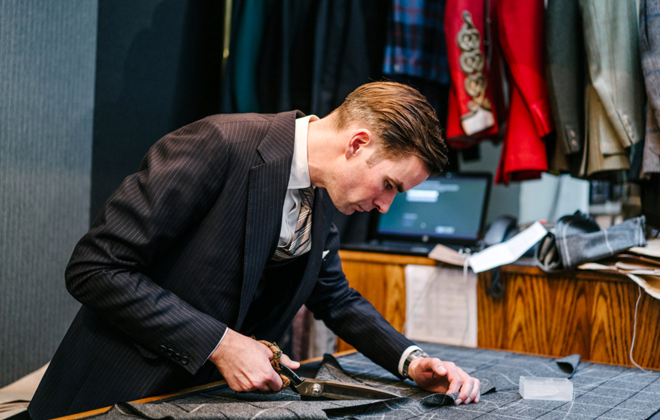 The shop is the first of the Savile Row tailors to come across the pond, and marks a renewed interested among men’s fashion in bespoke tailoring. Along with the full bespoke tailor shop, the New York location will have some ready-to wear pieces as well, which is also a first for the company. The Huntsman Creative Director is truly hands on. Photo: Tom Jamieson for The New York Times. Inside the NYC store. Photo: Tom Jamieson for The New York Times. On the cutting room floor. Photo: Tom Jamieson for The New York Times. It just goes to show that when things are made right, and made with care, they really do last. Now if only I had the occasion for a bespoke suit coming up. But who needs an excuse, really? I’m just going to do like Ms. Hepburn did and go for it! Life is short but my trousers surely won’t be.